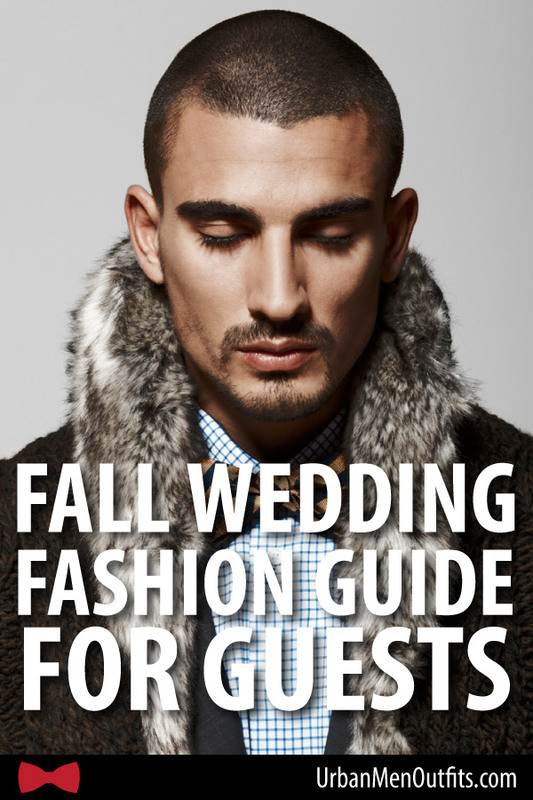 Find out what to wear to a Fall wedding. 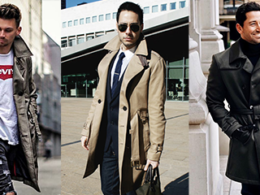 Discover male fashion trends for formal and semi-formal styles that are popular among men. Get inspiration from a carefully curated gallery of cool wedding outfits for male guests. A while ago, we did a post on guest outfits for summer weddings. Since the season of warm breeze and tanning is officially over, it’s about time we do another wedding attire post for the season we call fall (some call it autumn). In this article, you will find fashion tips and ideas a male wedding guest will find useful. You will also find images of awesome outfits that will help provide a solid idea as to how to mix and match different pieces of clothing. Since weddings are almost always a formal event, most outfits in the gallery feature shirts and jackets of various types – suit, sports, blazer. We have also curated some ideas that are more creative and rebellious, those will help provide some stimulus when you are ready to decide on what to wear. So many ideas, so little time. Let’s get the party going. Gone are the days when the color Pink is monopolized by the ladies. The modern man wears pink — and for that matter — any other colors he chooses to. This outfit below features a pastel-pink sports jacket on top of a white shirt. The Presidential-fold pocket square helps elevate the outfit to the next level. In terms of the belt and shoes, the choices are unorthodox but they exist in harmony with the rest of the setup. This outfit probably looks the best during the daytime, but it will work for an evening wedding too. Fall may be the season of colorful leaves, but it is less colorful than summer — it’s almost as if someone has turned down the saturation knob. So blend in, work with nature, not against it with this predominantly brown outfit. This isn’t the kind of outfit that shouts “Look at me! Look at me”, but at the same time, it hums authority and sophistication thanks to the plaid pattern on the jacket and the vertical stripes of the light-colored shirt. Just because you didn’t plan your outfit in advance doesn’t mean that it’s going to turn out terrible. Sometimes, constraints are the best stimuli for creativity. 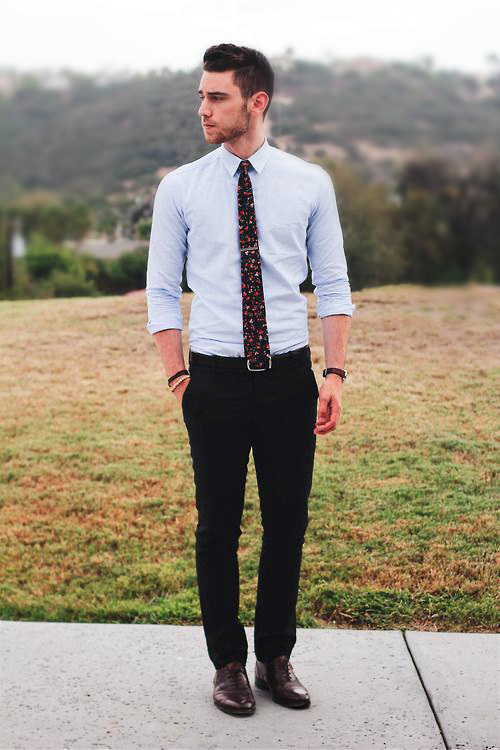 Casual shirt with small floral print semi-tucked in because tucked in all the way is too formal, not tucked in looks too casual. A comfy sports jacket accentuated by a checkered pocket square. Ripped jeans for extra style points and loafers — just because that’s why you wore yesterday. If there’s one look that will make you look smarter, this is it. Matching brown jacket and vest with elegant texture. Light-blue shirt that gives off the vibe of a knowledgeable engineer — purposely left untucked to suggest the creative side of the person underneath the somewhat conservative outfit. Denim pants to keep the brown-blue color scheme under control. The waterproof boots are perfect for an outdoor garden wedding after some mild rain in fall. 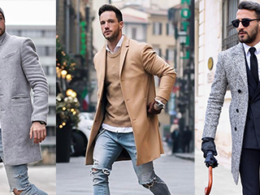 Nowadays when you see someone wearing a suit jacket (or a sports jacket, or a blazer — which comes between the former two in terms of formality), it’s almost always a single-breasted design, which is a shame because when it comes to looking classy, the double-breasted jacket blows the single-breasted jacket out of the water. 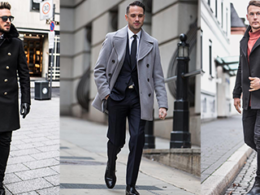 As long as it’s fitting, this jacket can look great on both slim and chubbier men. It is classy and versatile, but we won’t recommend this to a man with short stature because it adds too much weight to the upper body. The male model is shown pairing a navy-blue jacket that has marble-pattern buttons with a similar-color necktie. There’s something comforting in this color scheme — purple and gray. Like a patch of lavender hiding in the shade of an old building during a lazy afternoon in spring. Spring may be over but it will return again next year — this outfit is a testimonial of that return. Light-blue shirt. Brown vest with plaid pattern. Navy blue sports jacket and matching pants. Leather bag and shoes. The best outfit is the one that is fitting, period. Too big and it looks like you’re wearing someone else’s clothes; too small and you look like you’re going to a yoga class. Make yourself look smart in a fitting and wrinkle-free shirt and a pair of slim-fit suit pants. 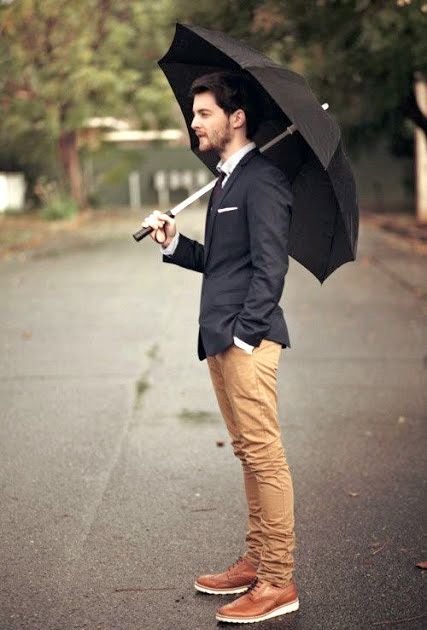 Complete the look with leather shoes that you have shined yourself. 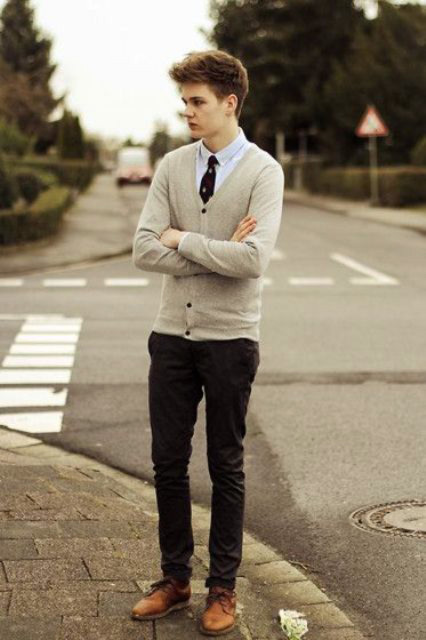 This outfit will make you look smart and respectful of the event without a suit jacket. You know how sometimes celebrity likes to keep a low profile in the public (to avoid paparazzi) but still want to look presentable? This is probably what a celebrity would wear to a high school friend’s wedding. Dark sunglasses for the coolness and anonymity. Comfortable white t-shirt. Dark blue — almost black — mandarin-collared suit jacket because conventional jackets are just too mainstream. Light gray slim-fit suit pants and loafers sans socks. Let’s get down to business. 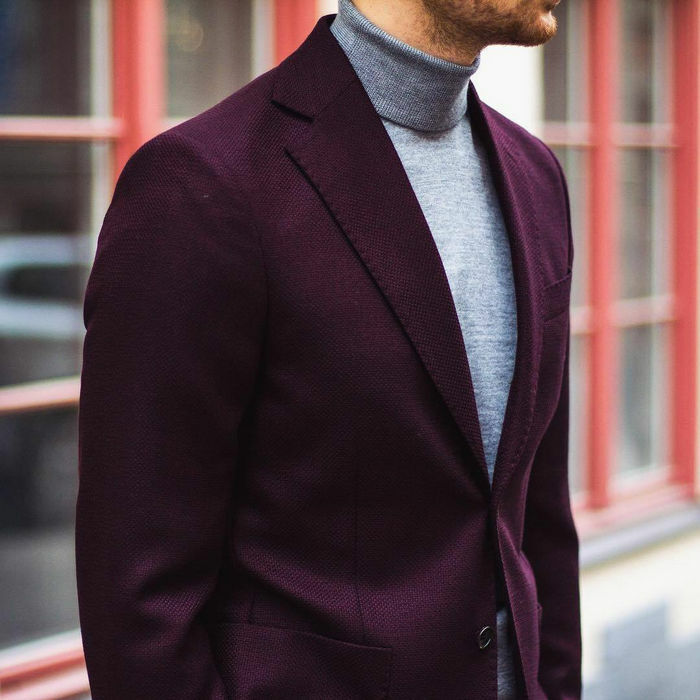 No-nonsense power suit jacket with dark-purple skinny tie. White shirt underneath the jacket. 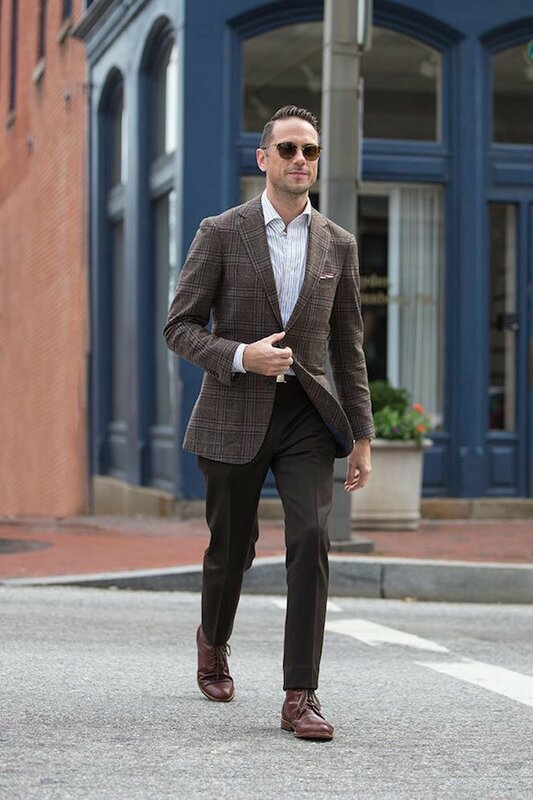 To tone things down a little bit and add some fall color to the combo, put on a pair of skinny khakis pants. The water-resistant leather boots provide strong support for the feet and a slight boost to its master’s height. Get dressed in a comfortable style that will make you feel more approachable. Striped shirt and solid-color tie are found resting comfortably underneath a warm sweater in light gray. 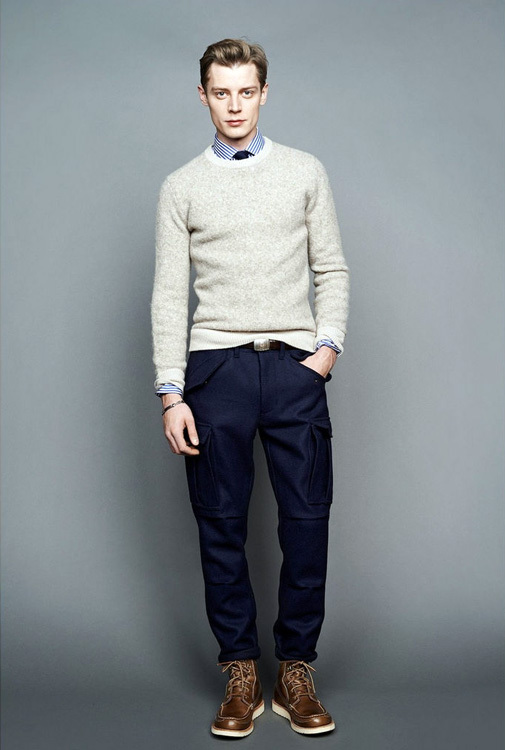 The front tip of the sweater is tucked in just so slightly to reveal the belt buckle. The pants are fitting – not too tight but not baggy either. To make the color scheme more interesting, the brown color is added to the existing gray and blue color palette through a pair of brown lace-up leather shoes. 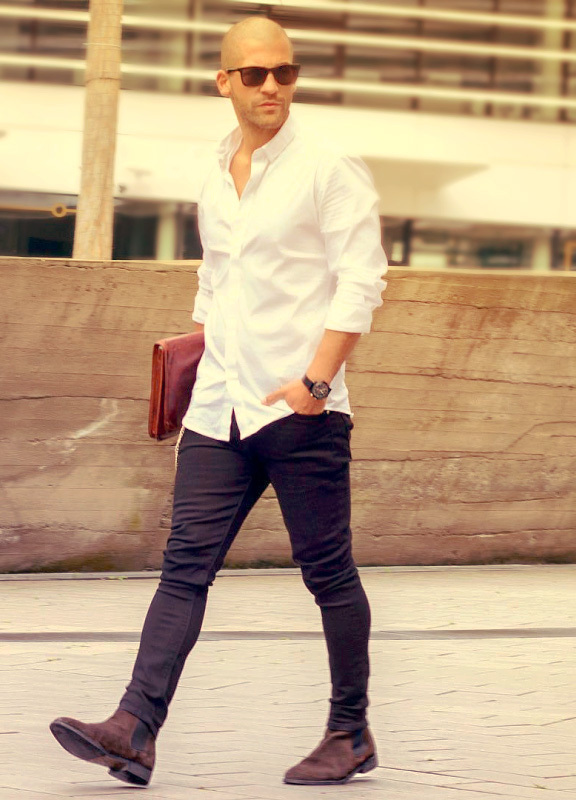 A simple but classy outfit featuring every man’s wardrobe essential — the white shirt. This combination requires minimal effort from you as long as you already have a white shirt ironed and ready to go. Best time to wear this is early fall. As the season progresses and the day gets colder, you may need to add more layers to keep yourself from catching a cold — perhaps a white t-shirt underneath or a sports jacket on top. The perfect outfit for a guy who wants to show some respect at the wedding ceremony but doesn’t want to totally compromise his diverse fashion sense. This rebellious outfit mixes and matches various fashion elements of different styles. V-neck plain white tee to ensure inner comfort. Oversized gray blazer jacket with rolled-up sleeves. Bold sports watch. The lower half of the outfit features a pair of dark gray skinny pants and what looks like adidas Gazelle sneakers. 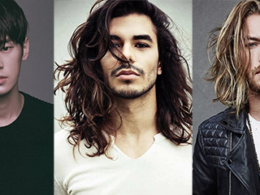 Complete the outfit with a wavy hairstyle. For men who don’t get uncomfortable with showing off his style and raise a few eyebrows in the process. Not that this outfit is outrageous, it just has this funk. Let’s start by going inside out. White shirt with a black bowtie – a sign of respect for the event. Cotton vest — a decorative layer for additional texture and also a protective layer against the fall breeze. Straight-cut pants with a subtle plaid pattern that only reveals itself if you pay close attention. Leather belt and color-blocked leather shoes. The highlight is the unique and festive jacket. Helped by its plaid pattern that is made up of grids of red, white, and gray lines, the jacket adds the missing essence that makes the outfit outstanding. The last outfit we have on this list is inspired by high school and college students. 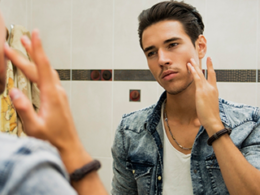 No, you don’t have to be a young man to be trying out this style, but it will definitely make you feel younger wearing it. While it may look like this outfit is effortless — it’s almost as if you can pull this off using only what is found in a man’s capsule wardrobe — you will definitely need to spend some time and money on the preparation and the acquisition of the components. As you can see from the picture below, every element of the outfit is fitting and in harmony with each other. 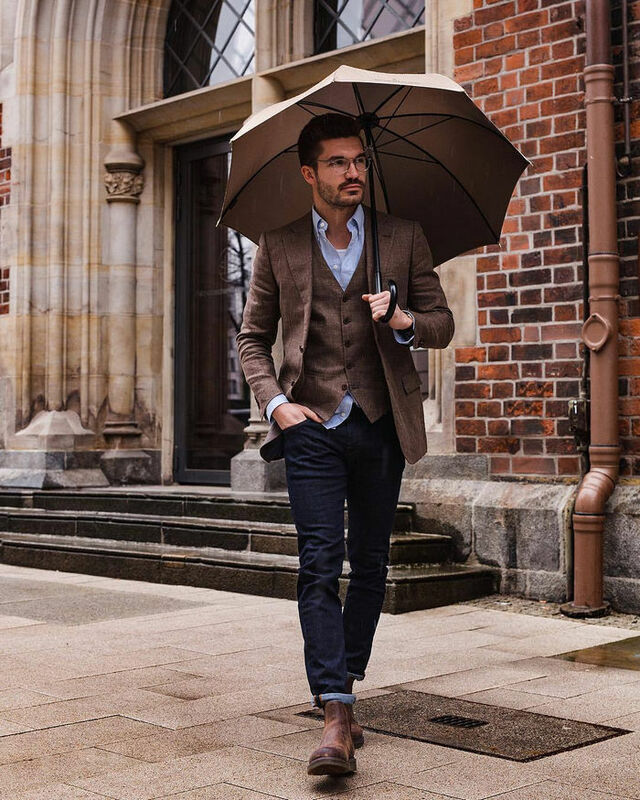 This outfit also works great for shorter men, as the tight pants help make the legs look longer and the shoes with thicker soles help add an inch or so to the confidence.